I‘ve been hearing a lot of debate lately about whether it is in Contractor’s, and Homeowner’s, best interest to forego lead based paint testing when remodeling a home built prior to 1978. As of October 2010, the EPA requires all contractors who work on homes built prior to 1978 to become certified lead based paint renovators. This requires them to enroll in an 8 hour course that teaches us how to contain all areas where demolition is being done and how to dispose of construction demolition materials. Following completion and passing of the course an application is sent in to the EPA for approval and certification is given. As a homeowner, you have the option of allowing the contractor to have the home tested or forego the testing prior to the start of construction and presume there is lead present and proceed per the EPA guidelines and follow all of the rules as they apply. It’s important to note that in California the Contractor is not allowed to do the actual testing but instead must hire a risk assessor to test and provide all of the required documentation. Most other states allow testing to be done by the Contractor with approved test kits. As mentioned earlier, all test results must be documented along with photos of areas tested, method of testing, and results found. At times following the guidelines set forth by the EPA for demolition can not only add significant expense to the project, but might also create some minor inconveniences. For example, once the area to be worked on is contained, i.e.,sealed in plastic with all openings blocked off and the required signage in place, the homeowner is not allowed into the contained area. So, in effect, if the demolition is to be ongoing for days or weeks, and the only access to the upstairs bedrooms is from the contained area, you would be forced to move out until the demolition is completed. Obviously a very costly endeavor that could shelf the project entirely. One of the reasons Contractors often recommend that homeowners opt out on testing and continue the work as if lead was present is that, as a homeowner selling the property, you are required by law to disclose that testing was done and the home tested positive for the presence of lead, (if results are positive). This could obviously have an effect on the sale of your property. In reality though, anyone buying an older home should be aware that there is a likelihood of lead being present. More so the older the home is. Is the area being contained an area that we can sacrifice it’s use for the given time frame. Do we plan on ever selling the home. Would we rather have the comfort of knowing if lead based paint is or isn’t present vs. never knowing. Will your prospective contractor be willing to provide optional pricing for doing the work presuming lead is present and following the guidelines vs.
having the home tested and providing a lower estimate if lead is found not to be present. If our contractor is certified, will they be doing the lead renovation or will they hire an abatement company for demo. and always opt to hire out. 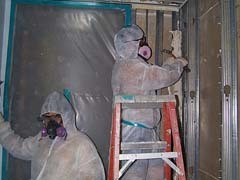 And for another Contractor’s perspective you might find this article from quailifiedremodeler.com useful. Please feel free to post your opinion on the subject. Your comments are welcome. Previous PostHousing Bust may prove to be a breeding ground for Unqualified Remodelers.Next PostRebuilding Together Sacramento Rocks!